The traditionally held hypothesis about the highly ordered organization of DNA describes the interaction of various proteins with DNA sequences to mediate the dynamic structure of the molecule. However, recent evidence has emerged that stretches of homologous DNA sequences can associate preferentially with one another, even in the absence of proteins. Researchers at the University of Illinois Center for the Physics of Living Cells, Johns Hopkins University, and Ulsan National Institute of Science and Technology (UNIST) in South Korea found that DNA molecules interact directly with one another in ways that are dependent on the sequence of the DNA and epigenetic factors, such as methylation. The researchers described evidence they found for sequence-dependent attractive interactions between double-stranded DNA molecules that neither involve intermolecular strand exchange nor are mediated by DNA-binding proteins. The investigators used atomic-level supercomputer simulations to measure the forces between a pair of double-stranded DNA helices and proposed that the distribution of methyl groups on the DNA was the key to regulating this sequence-dependent attraction. To verify their findings experimentally, the scientists were able to observe a single pair of DNA molecules within nanoscale bubbles. After conducting numerous further simulations, the research team concluded that direct DNA–DNA interactions could play a central role in how chromosomes are organized in the cell and which ones are expanded or folded up compactly, ultimately determining functions of different cell types or regulating the cell cycle. Formation of a DNA double helix occurs through Watson–Crick pairing mediated by the complementary hydrogen bond patterns of the two DNA strands and base stacking. Interactions between double-stranded (ds)DNA molecules in typical experimental conditions containing mono- and divalent cations are repulsive1, but can turn attractive in the presence of high-valence cations2. Theoretical studies have identified the ion–ion correlation effect as a possible microscopic mechanism of the DNA condensation phenomena3, 4, 5. Theoretical investigations have also suggested that sequence-specific attractive forces might exist between two homologous fragments of dsDNA6, and this ‘homology recognition’ hypothesis was supported by in vitro atomic force microscopy7 and in vivo point mutation assays8. However, the systems used in these measurements were too complex to rule out other possible causes such as Watson–Crick strand exchange between partially melted DNA or protein-mediated association of DNA. Here we present direct evidence for sequence-dependent attractive interactions between dsDNA molecules that neither involve intermolecular strand exchange nor are mediated by proteins. Further, we find that the sequence-dependent attraction is controlled not by homology—contradictory to the ‘homology recognition’ hypothesis6—but by a methylation pattern. Unlike the previous in vitro study that used monovalent (Na+) or divalent (Mg2+) cations7, we presumed that for the sequence-dependent attractive interactions to operate polyamines would have to be present. Polyamine is a biological polycation present at a millimolar concentration in most eukaryotic cells and essential for cell growth and proliferation9, 10. Polyamines are also known to condense DNA in a concentration-dependent manner2, 11. In this study, we use spermine4+(Sm4+) that contains four positively charged amine groups per molecule. To characterize the molecular mechanisms of DNA–DNA attraction mediated by polyamines, we performed molecular dynamics (MD) simulations where two effectively infinite parallel dsDNA molecules, 20 base pairs (bp) each in a periodic unit cell, were restrained to maintain a prescribed inter-DNA distance; the DNA molecules were free to rotate about their axes. The two DNA molecules were submerged in 100 mM aqueous solution of NaCl that also contained 20 Sm4+molecules; thus, the total charge of Sm4+, 80 e, was equal in magnitude to the total charge of DNA (2 × 2 × 20 e, two unit charges per base pair; Fig. 1a). 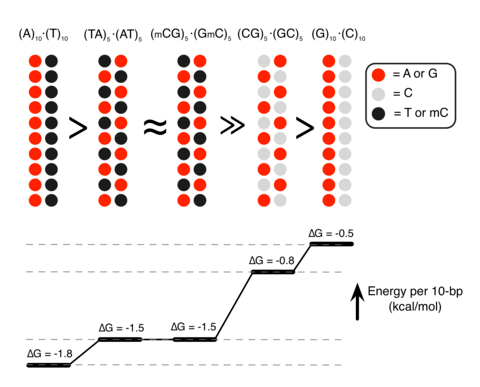 Repeating such simulations at various inter-DNA distances and applying weighted histogram analysis12 yielded the change in the interaction free energy (ΔG) as a function of the DNA–DNA distance (Fig. 1b,c). In a broad agreement with previous experimental findings13, ΔG had a minimum, ΔGmin, at the inter-DNA distance of 25−30 Å for all sequences examined, indeed showing that two duplex DNA molecules can attract each other. The free energy of inter-duplex attraction was at least an order of magnitude smaller than the Watson–Crick interaction free energy of the same length DNA duplex. A minimum of ΔG was not observed in the absence of polyamines, for example, when divalent or monovalent ions were used instead14, 15. Figure 1: Polyamine-mediated DNA sequence recognition observed in MD simulations and smFRET experiments. (a) Set-up of MD simulations. A pair of parallel 20-bp dsDNA duplexes is surrounded by aqueous solution (semi-transparent surface) containing 20 Sm4+ molecules (which compensates exactly the charge of DNA) and 100 mM NaCl. Under periodic boundary conditions, the DNA molecules are effectively infinite. A harmonic potential (not shown) is applied to maintain the prescribed distance between the dsDNA molecules. (b,c) Interaction free energy of the two DNA helices as a function of the DNA–DNA distance for repeat-sequence DNA fragments (b) and DNA homopolymers (c). (d) Schematic of experimental design. A pair of 120-bp dsDNA labelled with a Cy3/Cy5 FRET pair was encapsulated in a ~200-nm diameter lipid vesicle; the vesicles were immobilized on a quartz slide through biotin–neutravidin binding. Sm4+ molecules added after immobilization penetrated into the porous vesicles. The fluorescence signals were measured using a total internal reflection microscope. (e) Typical fluorescence signals indicative of DNA–DNA binding. Brief jumps in the FRET signal indicate binding events. 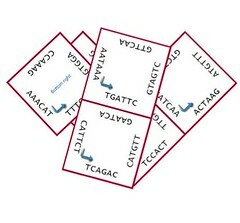 (f) The fraction of traces exhibiting binding events at different Sm4+ concentrations for AT-rich, GC-rich, AT nonhomologous and CpG-methylated DNA pairs. The sequence of the CpG-methylated DNA specifies the methylation sites (CG sequence, orange), restriction sites (BstUI, triangle) and primer region (underlined). The degree of attractive interaction for the AT nonhomologous and CpG-methylated DNA pairs was similar to that of the AT-rich pair. All measurements were done at [NaCl]=50 mM and T=25 °C. (g) Design of the hybrid DNA constructs: 40-bp AT-rich and 40-bp GC-rich regions were flanked by 20-bp common primers. The two labelling configurations permit distinguishing parallel from anti-parallel orientation of the DNA. (h) The fraction of traces exhibiting binding events as a function of NaCl concentration at fixed concentration of Sm4+ (1 mM). The fraction is significantly higher for parallel orientation of the DNA fragments. Unexpectedly, we found that DNA sequence has a profound impact on the strength of attractive interaction. The absolute value of ΔG at minimum relative to the value at maximum separation, |ΔGmin|, showed a clearly rank-ordered dependence on the DNA sequence: |ΔGmin| of (A)20>|ΔGmin| of (AT)10>|ΔGmin| of (GC)10>|ΔGmin| of (G)20. Two trends can be noted. First, AT-rich sequences attract each other more strongly than GC-rich sequences16. For example, |ΔGmin| of (AT)10 (1.5 kcal mol−1 per turn) is about twice |ΔGmin| of (GC)10 (0.8 kcal mol−1 per turn) (Fig. 1b). Second, duplexes having identical AT content but different partitioning of the nucleotides between the strands (that is, (A)20 versus (AT)10 or (G)20 versus (GC)10) exhibit statistically significant differences (~0.3 kcal mol−1 per turn) in the value of |ΔGmin|. To validate the findings of MD simulations, we performed single-molecule fluorescence resonance energy transfer (smFRET)17 experiments of vesicle-encapsulated DNA molecules. Equimolar mixture of donor- and acceptor-labelled 120-bp dsDNA molecules was encapsulated in sub-micron size, porous lipid vesicles18 so that we could observe and quantitate rare binding events between a pair of dsDNA molecules without triggering large-scale DNA condensation2. Our DNA constructs were long enough to ensure dsDNA–dsDNA binding that is stable on the timescale of an smFRET measurement, but shorter than the DNA’s persistence length (~150 bp (ref. 19)) to avoid intramolecular condensation20. The vesicles were immobilized on a polymer-passivated surface, and fluorescence signals from individual vesicles containing one donor and one acceptor were selectively analysed (Fig. 1d). Binding of two dsDNA molecules brings their fluorescent labels in close proximity, increasing the FRET efficiency (Fig. 1e). FRET signals from individual vesicles were diverse. Sporadic binding events were observed in some vesicles, while others exhibited stable binding; traces indicative of frequent conformational transitions were also observed (Supplementary Fig. 1A). Such diverse behaviours could be expected from non-specific interactions of two large biomolecules having structural degrees of freedom. No binding events were observed in the absence of Sm4+ (Supplementary Fig. 1B) or when no DNA molecules were present. To quantitatively assess the propensity of forming a bound state, we chose to use the fraction of single-molecule traces that showed any binding events within the observation time of 2 min (Methods). This binding fraction for the pair of AT-rich dsDNAs (AT1, 100% AT in the middle 80-bp section of the 120-bp construct) reached a maximum at ~2 mM Sm4+(Fig. 1f), which is consistent with the results of previous experimental studies2, 3. In accordance with the prediction of our MD simulations, GC-rich dsDNAs (GC1, 75% GC in the middle 80 bp) showed much lower binding fraction at all Sm4+ concentrations (Fig. 1b,c). Regardless of the DNA sequence, the binding fraction reduced back to zero at high Sm4+ concentrations, likely due to the resolubilization of now positively charged DNA–Sm4+ complexes2, 3, 13. Because the donor and acceptor fluorophores were attached to the same sequence of DNA, it remained possible that the sequence homology between the donor-labelled DNA and the acceptor-labelled DNA was necessary for their interaction6. To test this possibility, we designed another AT-rich DNA construct AT2 by scrambling the central 80-bp section of AT1 to remove the sequence homology (Supplementary Table 1). The fraction of binding traces for this nonhomologous pair of donor-labelled AT1 and acceptor-labelled AT2 was comparable to that for the homologous AT-rich pair (donor-labelled AT1 and acceptor-labelled AT1) at all Sm4+ concentrations tested (Fig. 1f). Furthermore, this data set rules out the possibility that the higher binding fraction observed experimentally for the AT-rich constructs was caused by inter-duplex Watson–Crick base pairing of the partially melted constructs. Next, we designed a DNA construct named ATGC, containing, in its middle section, a 40-bp AT-rich segment followed by a 40-bp GC-rich segment (Fig. 1g). By attaching the acceptor to the end of either the AT-rich or GC-rich segments, we could compare the likelihood of observing the parallel binding mode that brings the two AT-rich segments together and the anti-parallel binding mode. Measurements at 1 mM Sm4+ and 25 or 50 mM NaCl indicated a preference for the parallel binding mode by ~30% (Fig. 1h). Therefore, AT content can modulate DNA–DNA interactions even in a complex sequence context. Note that increasing the concentration of NaCl while keeping the concentration of Sm4+ constant enhances competition between Na+ and Sm4+ counterions, which reduces the concentration of Sm4+ near DNA and hence the frequency of dsDNA–dsDNA binding events (Supplementary Fig. 2). Analysis of the MD simulations revealed the molecular mechanism of the polyamine-mediated sequence-dependent attraction (Fig. 2). In the case of the AT-rich fragments, the bulky methyl group of thymine base blocks Sm4+ binding to the N7 nitrogen atom of adenine, which is the cation-binding hotspot21, 22. As a result, Sm4+ is not found in the major grooves of the AT-rich duplexes and resides mostly near the DNA backbone (Fig. 2a,d). Such relocated Sm4+ molecules bridge the two DNA duplexes better, accounting for the stronger attraction16, 23, 24, 25. In contrast, significant amount of Sm4+ is adsorbed to the major groove of the GC-rich helices that lacks cation-blocking methyl group (Fig. 2b,e). Figure 2: Molecular mechanism of polyamine-mediated DNA sequence recognition. (a–c) Representative configurations of Sm4+ molecules at the DNA–DNA distance of 28 Å for the (AT)10–(AT)10 (a), (GC)10–(GC)10 (b) and (GmC)10–(GmC)10 (c) DNA pairs. The backbone and bases of DNA are shown as ribbon and molecular bond, respectively; Sm4+ molecules are shown as molecular bonds. Spheres indicate the location of the N7 atoms and the methyl groups. (d–f) The average distributions of cations for the three sequence pairs featured in a–c. Top: density of Sm4+ nitrogen atoms (d=28 Å) averaged over the corresponding MD trajectory and the z axis. White circles (20 Å in diameter) indicate the location of the DNA helices. Bottom: the average density of Sm4+ nitrogen (blue), DNA phosphate (black) and sodium (red) atoms projected onto the DNA–DNA distance axis (x axis). The plot was obtained by averaging the corresponding heat map data over y=[−10, 10] Å. See Supplementary Figs 4 and 5 for the cation distributions at d=30, 32, 34 and 36 Å. If indeed the extra methyl group in thymine, which is not found in cytosine, is responsible for stronger DNA–DNA interactions, we can predict that cytosine methylation, which occurs naturally in many eukaryotic organisms and is an essential epigenetic regulation mechanism26, would also increase the strength of DNA–DNA attraction. MD simulations showed that the GC-rich helices containing methylated cytosines (mC) lose the adsorbed Sm4+ (Fig. 2c,f) and that |ΔGmin| of (GC)10 increases on methylation of cytosines to become similar to |ΔGmin| of (AT)10 (Fig. 1b). To experimentally assess the effect of cytosine methylation, we designed another GC-rich construct GC2 that had the same GC content as GC1 but a higher density of CpG sites (Supplementary Table 1). The CpG sites were then fully methylated using M. SssI methyltransferase (Supplementary Fig. 3; Methods). As predicted from the MD simulations, methylation of the GC-rich constructs increased the binding fraction to the level of the AT-rich constructs (Fig. 1f). The sequence dependence of |ΔGmin| and its relation to the Sm4+ adsorption patterns can be rationalized by examining the number of Sm4+ molecules shared by the dsDNA molecules (Fig. 3a). An Sm4+ cation adsorbed to the major groove of one dsDNA is separated from the other dsDNA by at least 10 Å, contributing much less to the effective DNA–DNA attractive force than a cation positioned between the helices, that is, the ‘bridging’ Sm4+ (ref. 23). An adsorbed Sm4+ also repels other Sm4+ molecules due to like-charge repulsion, lowering the concentration of bridging Sm4+. To demonstrate that the concentration of bridging Sm4+ controls the strength of DNA–DNA attraction, we computed the number of bridging Sm4+ molecules, Nspm (Fig. 3b). Indeed, the number of bridging Sm4+ molecules ranks in the same order as |ΔGmin|: Nspm of (A)20>Nspm of (AT)10≈Nspm of (GmC)10>Nspm of (GC)10>Nspm of (G)20. Thus, the number density of nucleotides carrying a methyl group (T and mC) is the primary determinant of the strength of attractive interaction between two dsDNA molecules. At the same time, the spatial arrangement of the methyl group carrying nucleotides can affect the interaction strength as well (Fig. 3c). The number of methyl groups and their distribution in the (AT)10 and (GmC)10 duplex DNA are identical, and so are their interaction free energies, |ΔGmin| of (AT)10≈|ΔGmin| of (GmC)10. For AT-rich DNA sequences, clustering of the methyl groups repels Sm4+ from the major groove more efficiently than when the same number of methyl groups is distributed along the DNA (Fig. 3b). Hence, |ΔGmin| of (A)20>|ΔGmin| of (AT)10. For GC-rich DNA sequences, clustering of the cation-binding sites (N7 nitrogen) attracts more Sm4+ than when such sites are distributed along the DNA (Fig. 3b), hence |ΔGmin| is larger for (GC)10 than for (G)20. Figure 3: Methylation modulates the interaction free energy of two dsDNA molecules by altering the number of bridging Sm4+. (a) Typical spatial arrangement of Sm4+ molecules around a pair of DNA helices. The phosphates groups of DNA and the amine groups of Sm4+ are shown as red and blue spheres, respectively. ‘Bridging’ Sm4+molecules reside between the DNA helices. Orange rectangles illustrate the volume used for counting the number of bridging Sm4+ molecules. (b) The number of bridging amine groups as a function of the inter-DNA distance. The total number of Sm4+ nitrogen atoms was computed by averaging over the corresponding MD trajectory and the 10 Å (x axis) by 20 Å (y axis) rectangle prism volume (a) centred between the DNA molecules. (c) Schematic representation of the dependence of the interaction free energy of two DNA molecules on their nucleotide sequence. The number and spatial arrangement of nucleotides carrying a methyl group (T or mC) determine the interaction free energy of two dsDNA molecules. Genome-wide investigations of chromosome conformations using the Hi–C technique revealed that AT-rich loci form tight clusters in human nucleus27, 28. Gene or chromosome inactivation is often accompanied by increased methylation of DNA29 and compaction of facultative heterochromatin regions30. The consistency between those phenomena and our findings suggest the possibility that the polyamine-mediated sequence-dependent DNA–DNA interaction might play a role in chromosome folding and epigenetic regulation of gene expression. Rau, D. C., Lee, B. & Parsegian, V. A. Measurement of the repulsive force between polyelectrolyte molecules in ionic solution: hydration forces between parallel DNA double helices. Proc. Natl Acad. Sci. USA 81, 2621–2625 (1984). Raspaud, E., Olvera de la Cruz, M., Sikorav, J. L. & Livolant, F. Precipitation of DNA by polyamines: a polyelectrolyte behavior. Biophys. J. 74, 381–393 (1998). Besteman, K., Van Eijk, K. & Lemay, S. G. Charge inversion accompanies DNA condensation by multivalent ions. Nat. Phys. 3, 641–644 (2007). Lipfert, J., Doniach, S., Das, R. & Herschlag, D. Understanding nucleic acid-ion interactions.Annu. Rev. Biochem. 83, 813–841 (2014). Grosberg, A. Y., Nguyen, T. T. & Shklovskii, B. I. The physics of charge inversion in chemical and biological systems. Rev. Mod. Phys. 74, 329–345 (2002). Kornyshev, A. A. & Leikin, S. Sequence recognition in the pairing of DNA duplexes. Phys. Rev. Lett. 86, 3666–3669 (2001). Danilowicz, C. et al. Single molecule detection of direct, homologous, DNA/DNA pairing.Proc. Natl Acad. Sci. USA 106, 19824–19829 (2009). Gladyshev, E. & Kleckner, N. Direct recognition of homology between double helices of DNA in Neurospora crassa. Nat. Commun. 5, 3509 (2014). Tabor, C. W. & Tabor, H. Polyamines. Annu. Rev. Biochem. 53, 749–790 (1984). Thomas, T. & Thomas, T. J. Polyamines in cell growth and cell death: molecular mechanisms and therapeutic applications. Cell. Mol. Life Sci. 58, 244–258 (2001). Sequencing became the household name. In 2000s, it was thought to be the key of the Pandora’s box for cure. Then, after completion of Human Genome Projects showed that there are less number of genes than expected. This outcome induce to originate yet another set of sequencing programs and collaborations around the world, such as Human Protein Project, Human Microorganisms Projects, ENCODE, Transcriptome Sequencing and Consortiums etc. It is in humankind to believe in magic and illusion. The strength of biological diversity and complex mechanism of expression may chalanges the set up of a simple but informative specific essay. Thus, there is a new developing field to mash rules of biology with mathematical formulas to develop the best bioinformatics or also called computational biology. Predicting transcription start or termination sites, exon boundaries, possible binding sites of transcription regulators for chromatin modification activities, like histone acetylates and enhancer- and insulator-associated factors based on the human genome sequence. Deep in mind, this assumption supports that the sequence contains signatures for chromatin modifications essential for gene regulation and development. There are three primary colors, red, yellow and blue, however, an artist can create many shades. Recently, scientists combining and organizing more data to make sense of our blueprint of life to transfer info generation to generation with the hope to cure diseases of human kind. Analyzing genome and transcriptome open the door. These studies suggested that all eukaryotic cells has a rich portfolio of RNAs. Among these long non-coding RNAs has impact on protein coding gene expression, regulating multiple processes even including epigenetic gene expression. Epigenetics, stemness and non-coding RNAs play a great role to manipulate and correct the gene expression not only at a proper cell type but also location and time within genome without disturbing the host. mechanism and relativity of a gene role with a single example for each. For example, DNA methylation occurs mostly on cytosine residues on the CpG islands usually located on promoter regions that are associated with tissue-specific gene expression. However, there are many other forms of DNA methylations, such as monoallelic methylation in gene imprinting and inactivation of the X chromosome, in repetitive elements, like transposons. There are two main mechanisms but this is not our main topic. Yet, Myc and hypoxia-inducible factor-1α versus certain methyl-CpG-binding proteins, such as MBD1,MBD2, MBD4, MeCP2, and Kaiso works differently. Stemness is an important factor for an intervention to correct a pathological condition. In terms of epigenetics, regulation and non-coding RNA Vascular endothelial growth factor A (VEGF-A) is an interesting example for differentiation of endothelial cells and morphogenesis of the vascular system during development with several reasons, epigenetics, gene interactions, time and space. Everything has to be just right, because neither less nor too much can fulfill the destiny to become a complete adult cell or an organism. For example, both having only one VEGF-A allele and having two-fold excess of VEGF-A results in death during early embryogenesis, since mice can’t develop proper vascular network. However, explaining diverse mechanisms and functions of VEGF-A is require more information with specific details. VEGF-A plays many roles in many pathological cases, such as cancer, inflammation, retinopathies, and arthritis because VEGF-A has also function in epigenetic reprogramming of the promoter regions of Rex1 and Oct4 genes, that are critical for a stem cell. Preferred mechanism is anti-angiogeneic state but tumor cells prefer hypermethylation to induce pro-angiogeneic state, thus VEGF-A stimulates PIGF in tumour cells among many other factors. Now, let’s turn around to observe development of a cell with Polycomb repressive complexes (PRCs) because they are important chromatin regulators of embryonic stem (ES) cell function. Originally, RYBP shown to function as transcriptional repressor in reporter assays from both in tissue culture cells and in fruit fly (Drosophila melanogaster ) and as a direct interactor with Ring1A during embryogenesis through methylation. In addition, RYBP in epigenetic resetting during preimplantation development through repression of germ line genes and PcG targets before formation of pluripotent epiblast cells. However, I do believe that the most important element is efficient repression of endogenous retroviruses (murine endogenous retrovirus called MuERV class), preimplantation containing zygotic genome activation stage and germ line specific genes. The selective repressor activity of RYBP is in the ES cell state. When RYBP−/− ES cells were analyzed by measuring gene expression during differentiation as embryo bodies formed from mutant and wild-type cells, the result presented that expression of pluripotency genes Oct4 and Nanog was usually downregulated. However, RYBP is able to bind genomic regions independently of H3K27me3 and there is no relation between altered RYBP binding in Dnmt1-mutant cells to DNA methylation status. In sum, RYBP has a large value in undifferentiated ES cells and may affect or even reset epigenetic landscape during early developmental stages. These are the gaps filled by long non coding RNAs. We learn more compelling information by comparing and contrasting what is normal and what is abnormal. As a result, pathology is a key learning canvas for basic mechanisms in molecular genetics. Then peppered with functional genomics completes the story for an edible outcome. We generally refer this as a Translational Research. For example, recent foundlings suggest that H19 contributes to cancer, including hepatocellular carcinoma (HCC) after reviewing Oncomine resource. According to these observations, in most HCC cases there is a lower expression of H19 level is compared to the liver. Thus, in vitro and in vivo studies were undertaken with classical genetic analyzes based on loss- and gain-of-function on H19 to characterize two outcomes depend on H19, that are the effects on gene expression and on HCC metastasis. First, the expression of H19 showed gene expression variation since H19 expression was low in tumor cells than peripheral tumor cells. Second, the metastasis of cancer based on alteration of miR-200 pathway contributing mesenchymal-to-epithelial transition by H19. Therefore, H19 and miR-200 are targets to be utilized during molecular diagnostics development and establishing targeted therapies in cancer. Long story short, there is a circle of life where everything is connected even though they look different. As a result, when we see a sunflower or a baby we remember to smile, because life is still an act to puzzle human. “Non-coding RNAs as regulators of gene expression and epigenetics” Cardiovascular Res 1 June 2011: 430-440. “Epigenetic regulation of key vascular genes and growth factors” Cardiovasc Res 1 June 2011: 441-446. “Epigenetic Regulation by Long Noncoding RNAs” Science 14 December 2012: 1435-1439. “Epigenetic control of embryonic stem cell fate” JEM 25 October 2010: 2287-2295. “Transcribed dark matter: meaning or myth?” Hum Mol Genet 15 October 2010: R162-R168. “Epigenetic activation of the MiR-200 family contributes to H19-mediated metastasis suppression in hepatocellular carcinoma” Carcinogenesis 1 March 2013: 577-586. “Vernalization-Mediated Epigenetic Silencing by a Long Intronic Noncoding RNA” Science 7 January 2011: 76-79. “Predicting the probability of H3K4me3 occupation at a base pair from the genome sequence context” Bioinformatics 1 May 2013: 1199-1205. This is just a small sample of presentations that you’ll be able to hear at TCEC: The Clinical Epigenome Conference in San Francisco, CA next month. Cancer cells typically exhibit aberrant DNA methylation patterns that can drive malignant transformation. Whether cancer cells are dependent on these abnormal epigenetic modifications remains elusive. We used experimental and bioinformatic approaches to unveil genomic regions that require DNA methylation for survival of cancer cells, suggesting these are key epigenetic events associated with tumorigenesis. Recent studies have shown that ten-eleven translocation (Tet) proteins can catalyze 5mC oxidation and generate 5mC derivatives, including 5-hydroxymethylcytosine (5hmC). Not only are Tet family proteins and 5hmC critical for the identity and normal function of embryonic stem cells and early embryonic process of development, but dysregulation of these newly identified epigenetic factors also plays a major role in cancer development. Here we report an essential role of Tet3 in animal development, and define 5hmC as a potential biomarker for tumor progression. These studies will significantly increase our current understanding of the biological functions of Tet proteins and 5hmC while providing mechanistic insight into the development of epigenetic therapeutics. Hematopoietic stem cell commitment and differentiation involves silencing of self-renewal genes and induction of a specific transcriptional program, which is controlled in part through dynamic changes in covalent cytosine modifications. We have studied how the abundance and distribution of these derivatized bases influences hematopoietic stem cell commitment during normal erythropoiesis as well as during leukemia development. The identification of recurrent mutations in several genes important in epigenetic pathways as well as mouse modeling suggest that the balance of covalent cytosine modifications is a key driver of normal blood cell development. I will also discuss how these findings impact our understanding of the activity of the ‘hypomethylating drugs’, now in common use for the treatment of myeloid malignancies. I will discuss our research on integrated genome-scale DNA methylation and mRNA expression data from microdissected lung adenocarcinoma and matched non-tumor lung. We have identified 164 hypermethylated genes showing concurrent downregulation, and 57 hypomethylated genes showing increased expression. Integrated pathways analysis and detailed examination of individual genes suggests mechanistic contributions of several of these genes to lung adenocarcinoma development and/or progression. I will present information on a number of candidate epigenetic driver genes for lung adenocarcinoma. Alterations in DNA methylation are a hallmark of human cancers, including prostate cancer. We carried out genome-scale analyses of DNA methylation alterations in multiple metastases from each of 13 men that died of metastatic prostate cancer and created DNA methylation cityscapes to visualize these complex data. These analyses revealed that each individual developed a unique DNA methylation signature that was largely maintained across all metastases within that individual. By analyzing their frequency, clonal maintenance, and correlation with expression, we nominated potential “driver” DNA methylation alterations that could be prioritized for development as epigenetic biomarkers and therapeutic targets. I will discuss some of our latest work around integrating micro-fabrication and solid state technologies with biomarkers. In diagnostics, a biosensor that could look for subtle structural or sequence variations at the single molecule level would be extremely useful . Epigenetic modifications have been linked with cancer, and we have developed nanopore technology to detect the methylation profile of a single molecule. The challenges and the potential of such technology will be discussed.